This blog is about my garden, the creatures in it and the way I encourage wildlife. All the photos are of my garden, unless I say otherwise. Come with me into my garden and enjoy! 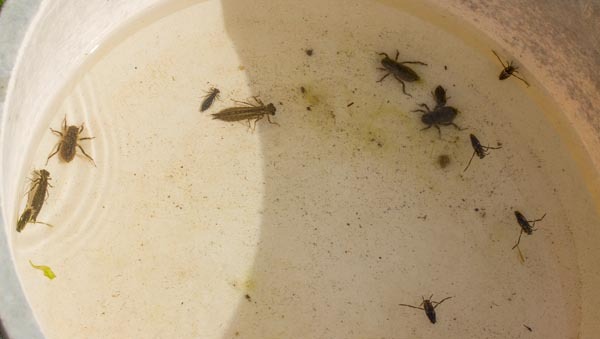 I’ve been surprised and pleased by the number of dragonfly larvae I’m finding in the pond this year. It has been necessary to net the blanket weed in the pond every day or two while the weather has been sunny: its growth is increased by sunlight. If you haven’t ever met blanket weed, it’s made up of hundreds of green, slimy filaments that form in the water and rapidly turn you nice clear pondwater into pea soup, although with less flavour (I presume – I’ve never tasted it!) Sometimes I pull it out by hand, and another way is to twine it round a stick or something similar, but I’ve been using the net to remove things like dead leaves at the same time, and it’s probably because I am using the net that I’m really noticing the dragonfly nymphs, as they wriggle around in the green slime. To share them with you, I caught some and put them in an old washing up bowl. They don’t like not having places to hide, so I only kept them as long as it took to take the photos. 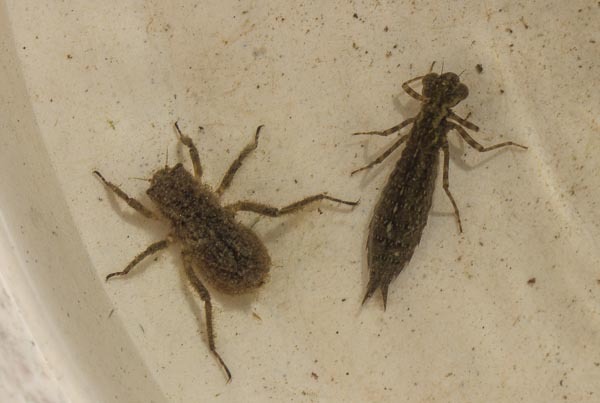 Together with the larva in the photo above are some backswimmers (also called water boatmen) – acquatic insects who have mastered the nifty art of swimming upside down; they are voracious predators, and carnivorous. I actually caught a couple of them apparently attacking the dragonfy larva, so I soon got them back into the pond. The two very differently sized larvae in the photo above may be different species, but I suspect they are the same species at different stages of growth. Dragonflies, like butterflies, do all their growing in the larval stage, and the adults emerge fully grown. I think they are Southern Hawkers, as we have seen the females laying in the pond, and have sometimes seen the emergence of the adults (magic!). The large one will emerge next year, but the smaller one may be with us for another year or even two before it is fully grown and comes out of the water. These two, however, are definitely different species, and I suspect the large one is again a Southern Hawker, while the smaller, wider one is a Broad-bodied Chaser. The differences will be echoed in the adult dragonfly: the Broad-bodied Chaser is just that: broad in the body but not so long, with a blue male, and an olive brown female. The Southern Hawker is a very long, sleek dragonfly, with the male being turquoise blue and the female green; it is a female in my husband’s hands below – she seemed to be stuck in among the reeds, so he waded in to get her out and she obligingly stopped to have her picture take. Dorset is an important county for dragonflies, with 28 out of the 39 British species breeding. 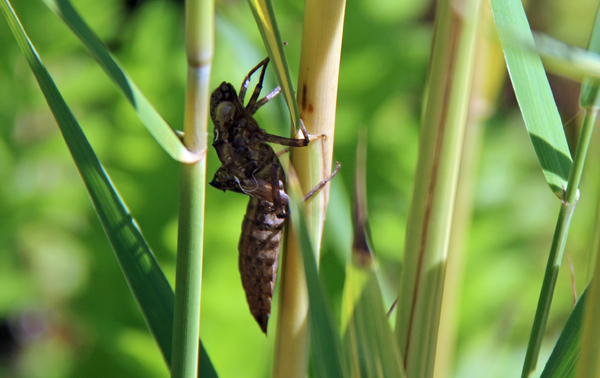 One of the biggest threats to dragonflies is the lack of (still) water for the larvae to live in, so if you can have a pond in your garden, please do: they are amazing creatures. If you want to know more, see the Dorset Dragonfly Group website. I’ve been having an exciting time with the odonata in my garden the last few days – that is, dragonflies and damselflies. We’ve been seeing Broad-bodied Chasers around for a little while now – see my article on 14 June. I wasn’t, however, aware they were breeding in the pond until I was scooping blanket weed out a few days back (a daily job if I want to be able to see anything) and found I’d got a dragonfly larva which was so broad that it had to be one of this species. Then today, I’ve actually seen a female laying in the mud on the edge of some reed roots – she was hovering, bending her abdomen forward and jabbing the egg into the mud, then repeating the process numerous times. A dragonfly question that has been puzzling me is why we haven’t seen any Southern Hawkers emerge from the pond in the last couple of years, when previously they had been regulars, usually going up around the end of May. We know they laid last year, because we say the female doing so: she laid both on the greenery around the edge of the pond, and into cracks in the bark of two logs we’ve got by the bench to serve as tea mug holders. To my complete delight, we have just had two come out, which we know because we’ve just found the empty cases, which remain clinging to the reeds in a slightly eerie way (see photo below). We guess they were just later than usual, unless they are a different species: in theory you can tell from the empty cases, but you have to be an expert to do it. I know there are still at least five large larvae in the pond, so hopefully we’ll see evidence of more emerging. I also spotted another dragonfly in the garden – one I’ve not seen before. I think its a Common Darter female (see below). 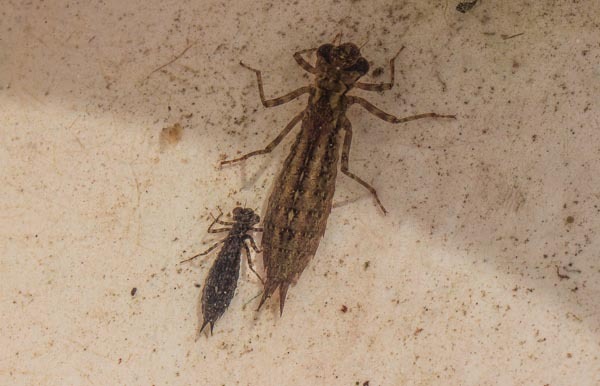 I am finding some smaller larvae in the pond, but I’m not expert enough to tell what they are, or even whether they are of a smaller species, or are just younger: like butterflies, dragonflies do all their growing in the larval stage, so they start small and get bigger, periodically shedding their skin. We are also getting Large Red Damselflies, and another turquoise species, which I must see if I can find a name for. 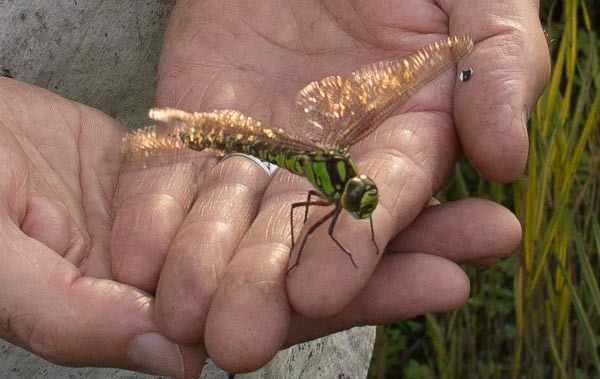 If you are seeing dragonflies, do report them to the Dorset Dragonfly Group. And if you possibly can, have a pond in your garden – they may well come. One of the best things about having a pond in your garden is the wildlife it attracts. I tend to see two of the larger dragonflies: the Southern Hawker and the Broad-bodied Chaser, and the first sighting of either in the year is a really “whoopee!” moment. This female Broad-bodied Chaser appeared (or I first saw her) on 31 May, which fits in with their peak flight period of May to July – they live up to their name, and are broad in the body, and thus easy to identify; they are also common in England, so you are quite likely to see one. She was flying around the flower bed, and obligingly stopped for some time on a flower stalk for me to photograph her. The male turned up on 6 June. 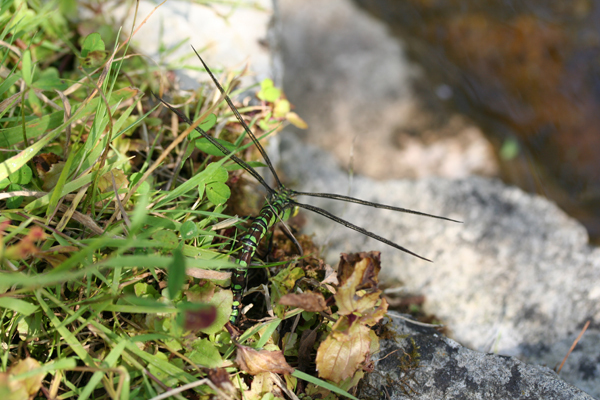 He stuck to the area around the pond, exhibiting typical male dragonfly behaviour in patrolling round and round, perching from time to time in various places; he didn’t settle for long, so he was more of a challenge to photograph. Twice since then, we have seen a male and female Broad-bodied Chaser coupled together. It’s so amazing that they can fly while copulating, and at first glance you wonder what this odd creature flying round you is. Hopefully, the female will lay eggs in the pond and we’ll have more generations of this gorgeous dragonfly to come. If you want to know more about dragonflies in Dorset, have a look at the Dorset Dragonfly Group website.